Catholic Halloween! It’s our feast, and we’re going to enjoy it! 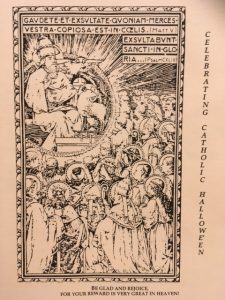 This magazine-sized, roughly 40-page booklet includes not only the history and delightful traditions of All Hallows E’en (including begging for soul cakes on the vigil of All Saints Day) but helps us and our children to embrace the majesty and beauty of our traditions as a Catholic family: a family that never stops loving each other, even after death. 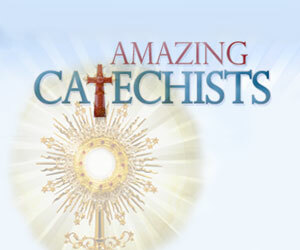 Lessons in various academic disciplines, including lovely catechetical games, activities, word games, traditional liturgies, coloring pages, crafts, recipes, litanies, processions, vocabulary lists for various levels, recommended resources, prayers, insights into related sacramentals, and simple but beautiful songs for increasing the joy and reverence of your celebration. With this simple but value-packed resource, you will be empowered to help children and adults experience the thrill of learning about the lives of the saints and the Holy Souls in purgatory–their family and friends in the Communion of Saints. In the traditional calendar of the Church, Mondays are devoted to the Holy Spirit and the Holy Souls, so I’d like to close on this Monday morning by asking for prayers for the soul of Carmella R. Kosinski, a wife, mom, and teacher, who died last week. 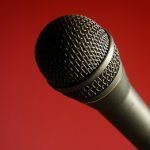 She is the very beloved mom of John Harper, the host of Morning Air, on Relevant Radio. He treasured and cared for her in his home, for years. Please say a Hail Mary or an Our Father for her soul and ask the Holy Spirit to comfort John and his family. May their souls and all the souls of the faithful departed, through the mercy of God rest in peace. Amen. and in my family. Amen. The Catechism of the Catholic Church tells us that our prayers for the Holy Souls not only helps them to get to heaven faster but enables them to pray for us–and their prayers are powerful. These are friends we want to have and want our children to know and love. 958 Communion with the dead. “In full consciousness of this communion of the whole Mystical Body of Jesus Christ, the Church in its pilgrim members, from the very earliest days of the Christian religion, has honored with great respect the memory of the dead; and ‘because it is a holy and a wholesome thought to pray for the dead that they may be loosed from their sins’ she offers her suffrages for them.” Our prayer for them is capable not only of helping them, but also of making their intercession for us effective. Please share your favorite All Saints and All Souls resources, including prayers, lessons, and activities, in the com boxes!